With four of our six grands living in Georgia and two in Louisiana, I don’t get to love on them in person nearly as often as I want to. I am thankful, though, for sons and daughters-in-law who keep me connected via anecdotes and images of their activities and conversations. But I need a regular “fix” to satisfy that ever-present longing for time in-person with the grands and their parents. Our trip the week preceding Easter provided part of that fix with a happy dose of the Georgia grands. Yesterday, husband Walter gave me the rest of my grandkid fix. We picked up Walter’s mother and headed west for Baton Rouge, LA. We spent several hours filled with Molly Kate’s dances that she choreographed, Walker and Baboo playing in the “toy room,” and both siblings engaging Baboo in made-up games requiring abundant romping. Molly Kate also involved me in her newest sticker book, the modern equivalent of the paper dolls of my childhood. Not to be left out, Walker brought out his Elmo sticker book while Molly Kate colored in her Hello Kitty activity book. In between, the pair induced euphoria for Nana by climbing in my lap for cuddling, tickling and nibbling on ears. As lunchtime approached, a spent Walker went to sleep in Baboo’s lap and was installed in his new “big boy” bed. After Jeremy served up a scrumptious panini lunch accompanied by fresh fruit, we headed home. I borrowed the photo for this post from daughter-in-law Katie’s blog, The Daily Skup. Jeremy and Katie had teamed up for a photo session with Jeremy as photographer and Katie as kid wrangler. Katie blogged about their experience here. I can so identify with need a grand "fix"! The two in the pic are precious; I will have to visit Katie's blog. Your week will be brighter with all those grand memories to make you smile! I know you must have had a BALL. And I love this precious picture, because you know that I have had a soft spot in my heart for Molly Kate, she is my favorite. What a wonderful time you got to enjoy. I loved the climbing in lap and snuggling part. How sweet. they are sooo beautiful, both of them. a great shot on the bench to. glad you had so much fun, i love sticker books even now. That photo of your grandkids is so sweet and cute. It's hard to get my 2 year old grandson to smile like that. Or rather, it is hard to photograph him because he doesn't stay still -- always turning his head or lifting his hand to his face, at the last minute! Lol. Ah well, I did manage to get some nice shots, though. Why don't you print out that photo and frame it? 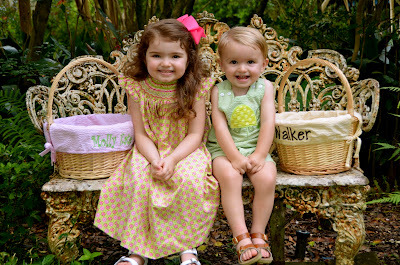 Beautiful grandchildren! I can understand why you needed a "grand fix" :) It's hard to believe little Walker is so big already! I am glad you got your fix, now you're happy again for a while. It's sad when we live too far away to see them frequently. I think I know what your paper dolls were. Mine were cut outs or pop outs and there were paper clothes too to put on them, with little tags to go round the back. Is that how yours were? I didn't know they were called paper dolls; I've been trying to find them or their name for ages to mention them in my memoir. I understand the need for a fix from the grandchildren. I'm so happy you were able to spend some time with these precious children. I don't blame you for needing your "fix". My other 2 grandkids live in Oregon and I don't get to see them very often. Its hard to know what's going on in their lives. I wish they were better communicators. Anyway I love them all and I know you loves yours just as much.